On our Wedding Wednesday posts, love is always in the air. Let's celebrate all of our Clemson love stories with a giveaway! 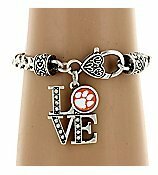 Win this gorgeous designer-inspired crystal accented Clemson "Love" bracelet. Wear it on your big day or for the big game. Deadline for all entries is tonight at Midnight, EST. A winner will be drawn at random tomorrow, May 23, and contacted by email. The winner will have 48 hours to reply by email or we will draw a new winner. Good luck Clemson Girls and Happy Wedding Wednesday!